In third pAsuram, AzhwAr says “Even by his divine activities related to the universe such as annihilation etc, emperumAn is the supreme lord; those who do not agree with this can come and debate with me”. Subsequently, AzhwAr says “The protection etc of the universe which is an effect [from the cause], is that which reveals the lord’s supremacy”. pEsumin – tell me (if there is any one). Even after seeing clearly emperumAn creating many different dhEvathAs and their many different vast worlds, back then consuming all the worlds immediately (during deluge) concealing them from the deluge, spitting them out (after the deluge), owning them up fully and rescuing them, you are unable to have clarity; there is no independent dhEvathA present that is not a prakAram (form) of the supreme lord who is standing in thirunagari and who is being bowed and worshipped by all dhEvathAs; oh the residents of different worlds! tell me if there is any such dhEvathA. parandha dheyvamum – The different dhEvathAs who have grown vast and covering the supreme lord, like a fruit will be covered by the creeper. These dhEvathAs are highlighted [to show their celestial powers] and then discarded [saying that they are not the supreme lord]. pal ulagum – The vast worlds which can behold the vastness of those dhEvathAs. The other controlled chEthanas (sentient beings) who make these dhEvathAs controllers. padaiththu – creating the. Having no distinction between the dhEvathAs and others, when it comes to creation. anRu udanE vizhungi … – While creating, emperumAn did that in an order; svEthAsvathara upanishath “yO brahmANam vidhadhAthi pUrvam“ (first bhagavAn created brahmA); but when there is imminent danger [of deluge], he cannot protect in a particular order [he immediately protects]. Placing the worlds inside him during deluge, and concealing their presence to protect them further from the deluge, and thinking that the worlds are suffering inside and releasing them out at the appropriate time, and amidst all this if the likes of mahAbali snatches the worlds like an eagle catching its prey, then measuring them up and recapturing them, and when the world became submerged during [intermediate] deluge and became attached to the wall of the material realm, assuming the form of varAha and rescuing it. These various activities [are] performed by emperumAn. kaNdum – For AzhwAr, SAsthram is more clearly visible than prathyaksham (perception). Seeing these super-human abilities, while it is easy to understand that emperumAn is the one to be surrendered unto, you are not knowing that. theLiyagilleer – Except for their clarity or lack of the same, there is no change in the underlying principle [of emperumAn’s supremacy]. Except for your clarity or the lack of the same, no one can make emperumAn the supreme lord or not [he is always the supreme lord]. sirangaL … – Though you remain indifferent and think that “emperumAn is not the creator of all and he is not the one who helps everyone in danger”, at least if you first see the activities of the dhEvathAs you worship, you will acquire clarity. At least by seeing their attitude of bowing to emperumAn thinking “the purpose of having a head is fulfilled by bowing in front of emperumAn’, you surrender unto emperumAn. mahAbhAratham rAja dharmam “pAdhEna kamalApEna brahma rudhraArchithEnA” (emperumAn gently touched with his divine feet which were worshipped by brahmA, rudhra et al); perumAL thirumozhi 4.3 “pinnitta sadaiyAnum piramanum indhiranum thunnittup pugalariya” (thiruvEnkatam, the divine abode, which is difficult to enter for rudhra who has matted hair, brahmA and indhra); periya thirumozhi 1.7.8 “nAththazhumba nAnmuganum IsanumAy muRaiyAl Eththa” (brahmA and rudhra are emotionally praising emperumAn in an orderly manner). thirukkurugUr adhanuL paran – This is even beyond emperumAn’s manifestation of supremacy in a human form. As one approaches this side [from supremacy to simplicity], his greatness increases manifold. An entity is glorified based on its qualities; only here in archAvathAram, his qualities are well present. adhanuL paran – As said in rig vEdham “dhvA suparNA sayujA sakhAyA samAnam vruksham parishasvajAthE | thayOranya: pippalam svAdhvaththi anaSnannanyO abichAkasIthi ||” (There are two related (servant and master) birds (jIvAthmA and paramAthmA) residing in a tree (body). One bird (jIvAthmA) enjoys the fruits of its actions (karma) and the other one (paramAthmA) being detached is radiantly witnessing that), as the chEthanas (AthmAs – souls) become dimmer the more they engage in worldly activities and emperumAn’s radiance will increase due to his controlling nature while residing with them, his supremacy too becomes radiant the more he engages with samsAris (worldly people) [in his archA form]. thiRam anRi – Anything which is not his prakAram (form). dheyvam maRRillai – AzhwAr is not discarding/rejecting the existence of dhEvathAs; since he desires to see emperumAn’s vibhUthi (wealth/opulence) [which the dhEvathAs are also part of]; he is simply rejecting their independence [and establishing that they are all dependent on bhagavAn]. There is no dhEvathA which is fully independent and exists for its own self. If you consider them to be his prakAram (form) and surrender, that will imply that you are surrendered unto him; but if you consider them to be independent and surrender unto them, there is nothing purposeful in that; “nEhanAnAsthi” (there is nothing independently existing) etc. 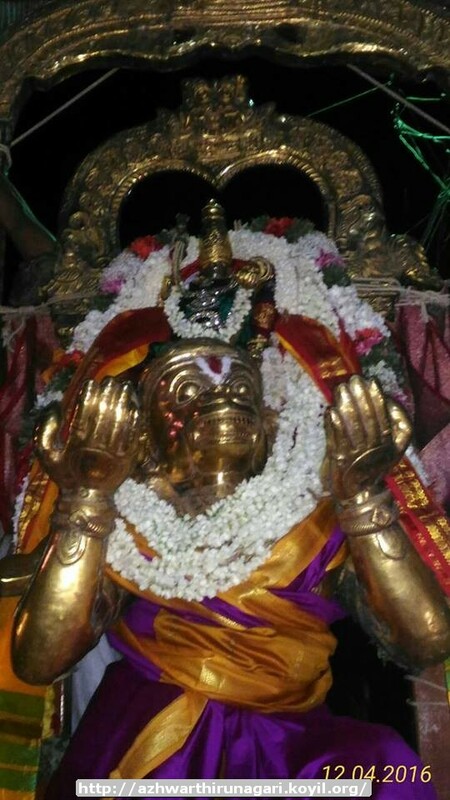 pEsuminE – I said “there is no dhEvathA who is independently existing without being his prakAram”; if there is anyone who is capable of saying “there is a dhEvathA who is having as his prakAram, such emperumAn who is not ruled over by anyone and who controls everyone,”, then they can come and tell that in front of me. This entry was posted in thiruvAimozhi, thiruvAimozhi 4th centum on April 26, 2017 by Sarathy Thothathri.